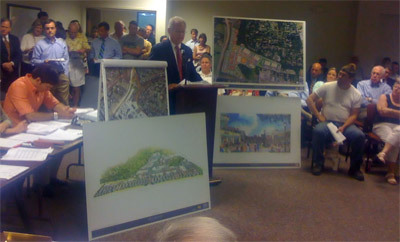 6/25/08 - Councilman Weiner held a community meeting at St. Joseph’s on the Brandywine regarding the Stoltz organization’s development proposals for Barley Mill Plaza, #20 Montchanin Road (the old Columbia Gas site) and the Greenville Center. Almost 200 residents attended. Stoltz representatives presented their plan to about 20 people at a second meeting scheduled on the same night. 7/8/08 - The Stoltz Exploratory Plan for the Barley Mill Plaza site has been found unacceptable by our New Castle County Land Use Department professional planners. Click here to read the full update and the County Land Use Department’s 7/8/08 letter.